A Georgia police officer is dead after an apparent ambush, while his colleague’s life was spared by his radio. 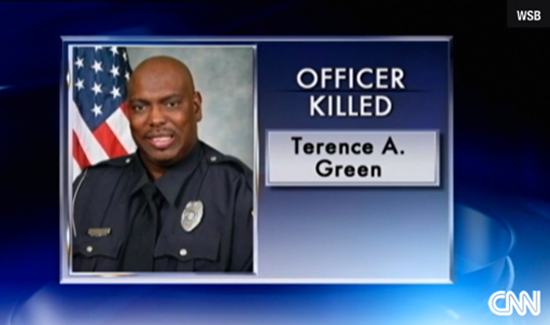 Fulton County Police officer Terence Green, 48, was killed on Wednesday while responding to a call for shots fired. A second officer was shot in the hip, but suffered no injuries. According to a report on CNN: “It was actually his radio—the bullet went through—the radio saved him. It penetrated the radio,” said Fulton Police Chief Cassandra Jones. The incident occurred when police were searching a neighborhood after reports of gunfire from the home of Amanuel Menghesha, 42. Police said the officers were shot with an “assault style rifle.” Menghesha was then shot by other officers. Fulton County Chairman John H. Eaves released a statement after learning of Green’s death. Alfred Printup, who lives in the subdivision, said he was at work when the shots rang out. He was on the phone with his wife and could hear the gunshots. “I just want to thank that police officer who gave his life to keep my family safe,” Printup said. May he RIP. I feel so blessed having served 31 years as a police officer and being retired for 29 years. Police work is very dangerous and now days it is even worse. There are. So many people who are just waiting for the chance to kill a police officer. It will be that way until our government brings back the death penalty. It is all right to kill a police officer but when an officer fights back and shoots or strikes a suspect, then these people wants to hang these officers.. I know that we have a few bad apples on the force but the majority of them are out there doing what they are suppose to do and that is, to protect and serve the citizens…most departments try and get rid of the bad apples .